Boughrood has developed on the terrace on the east side of a small unnamed stream where it runs into the River Wye. The ground rises gently to the east and, separated by the shallow valley of another brook, Boughrood Castle surmounts a spur projecting towards the Wye. The settlement lies about 14km to the north-east of Brecon and just over 10km south-west of Hayon- Wye. This brief report examines the emergence and development of Boughrood up to 1750. For the more recent history of the settlement, it will be necessary to look at other sources of information and particularly at the origins and nature of the buildings within it. The accompanying map is offered as an indicative guide to the historic settlement. The continuous line defining the historic core offers a visual interpretation of the area within which the settlement developed, based on our interpretation of the evidence currently tohand. It is not an immutable boundary line, and may need to be modified as new discoveries are made . The map does not show those areas or buildings that are statutorily designated, nor does it pick out those sites or features that are specifically mentioned in the text. We have not referenced the sources that have been examined to produce this report, but that information will be available in the Historic Environment Record (HER) maintained by the Clwyd-Powys Archaeological Trust. Numbers in brackets are primary record numbers used in the HER to provide information that is specific to individual sites and features. These can be accessed on-line through the Archwilio website (www.archwilio.org.uk). The preparation of this report has been funded by Cadw, the historic environment service of the Welsh Assembly Government. The name is also given as Bochrwyd, and it is acknowledged by experts that it is a difficult appellation to understand. A possibility is that it combines the elements boch and rhwyd which could mean a ‘jaw-shaped net’, and allude to a fish trap in the Wye. The earliest documentation is as Bouret in 1205 and as Bocred in 1242/3. Antiquarian speculation favoured bach-rhyd meaning 'little ford', referring to a crossing of the Wye, but this does not seem to be favoured in modern thinking. The dedication, the shape of the churchyard and the location beside the river suggest that the church at Boughrood was an early medieval foundation. Boughrood is mentioned in a list of places granted fair and/or market rights to Thomas, Bishop of St Davids, at the end of the 13th century. This does not necessarily signify that there was a nucleated settlement here, rather than the manor had been given the rights. The village core has changed little in the last century and a half with no more than a handful of dwellings around the church. 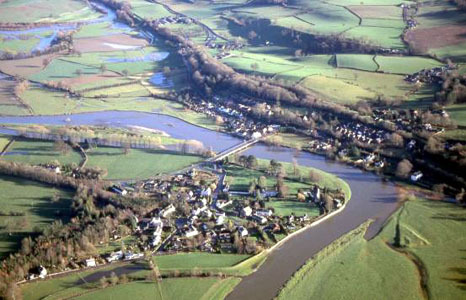 Modern development has focussed on Station Road towards the bridge across the Wye, where a mill, toll house and a row of cottages attest activity in the 19th century that presumably developed as a result of the construction of the bridge. The 17thcentury development, however, was around the church and this pattern may extend back into the late medieval era. The small church of St Cynog (16005) was rebuilt in 1854. Nothing of its predecessor remains, but earlier 19th-century reports, particularly that by Sir Stephen Glynne suggest a simple building with nothing remarkable about it. The churchyard (16082), irregularly circular, is raised up to one metre internally in its southeast quadrant. The northern two-thirds of the interior is raised above the rest but this could be due to the natural ground slope or past burial practice rather than being the relic of an earlier smaller 'llan'. The Tithe survey shows that in the mid-19th century a lane or track encompassed the entire churchyard, but by the end of the century those parts of the track on the west and south had been incorporated into he churchyard. Earthworks of undefined character (16083) but possibly indicative of a shrunken settlement survive in pasture immediately to the north of the churchyard (7639). These though have not been subjected to field assessment. The presence of a straight lane linking the church and the medieval castle could also signal the possibility of a settlement emerging to the east of the churchyard, though there is as yet no substantive evidence to support this contention. Surrounding the churchyard are three cruck-framed houses, Boughrood Court, a cruck-framed hall-house (16084), Forge Cottage (16085) and the initially timber-framed Village Farm (20620), all with 17th-century and in two cases perhaps even 16th-century origins. Neuadd, a short distance to the north, also appears to be 17th-century. Nearly 500m to the east is Boughrood Castle (500; SAM Rd072), a low motte, its summit enclosed by a bank and containing fragments of a masonry tower, which is presumably the one referred to in the document of 1205. It has been suggested that the motte was thrown up at the end of the 11th century, and despite various vicissitudes the castle may have continued in use into the 13th century. The mound is surrounded by a ditch and outer bank but its southeast sector as well as the bailey has been destroyed during the building of the adjacent Castle Farm. Excavations on the motte top were undertaken in 1966 and revealed traces of the tower, but a full report does not appear to have been published. Boughrood Castle itself (16082) is an early 19th-century stone building with a Grade II listing, enclosed by landscaped gardens.